In my opinion, the conservation of a scalar quantity (like energy) is simpler than conservation of a vector quantity (like momentum). Collisions are an easy way to “break” the energy model, i.e., it’s not useful for analyzing collisions. There are several collisions which all start with the same amount of kinetic energy, but have different outcomes. Kinetic energy not always constant before/after. Outcomes ranged from all kinetic transferred to none transferred. Explored a careful sequence of collisions where students had to draw before/after pictures, bar charts, and look for what remained the same (based on a similar progression from Etkina). Again, we used the Red and Blue Pasco carts and tracks to see the collision and used the Air Track Simulation to collect quantitative data. To get a feel for how the conversation flowed, it’ll be helpful if you read a post from 2 years ago called Inventing Momentum. What’s new this year is that I’ve created a worksheet to help students keep organized notes for the discussion (snapshots below). A 1-kg red cart moving right at 4 m/s collides elastically with a 1-kg blue cart at rest. 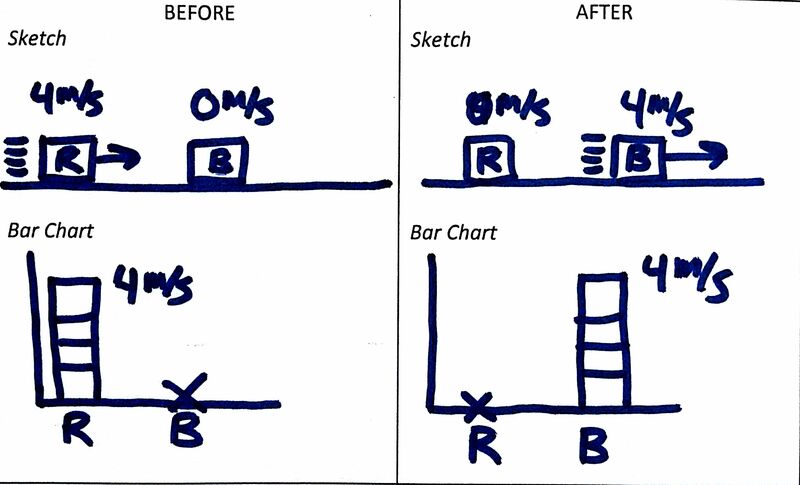 We draw speed bar charts and we see that speed is constant before and after. A 1-kg red cart moving right at 4 m/s collides inelastically with a 1-kg blue cart at rest. We draw speed bar charts, but see that total speed is constant before and after. Does this new pattern still work with the previous scenario? A 1-kg red cart moving right at 4 m/s collides inelastically with a 1-kg blue cart moving left at 4 m/s. Total speed is NOT constant, but total velocity is constant. So now our bar charts become velocity bar charts. We draw the negative velocity bars downward. Does this new pattern still work with the two previous scenarios? A 2-kg red cart moving right at 2 m/s collides inelastically with a 1-kg blue cart moving left at 4 m/s. Total velocity is NOT constant. 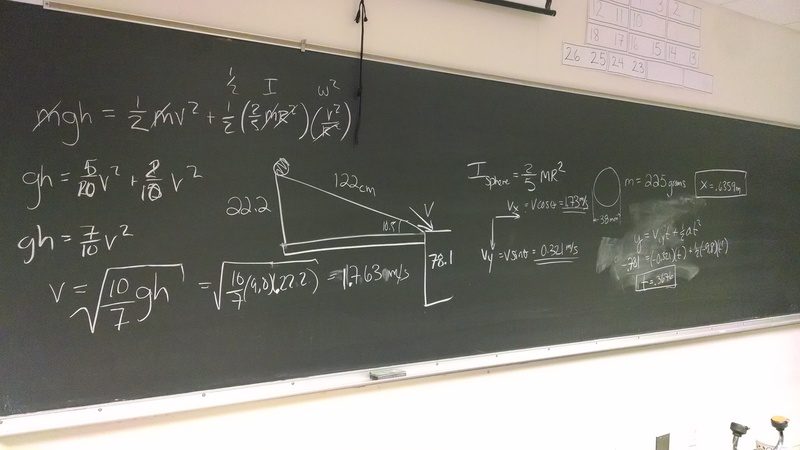 But the total “mass-velocity blocks” are constant before and after (see Inventing Momentum). So now our bar charts become mass-velocity bar charts. Does this new pattern still work with the all the previous scenarios? A 2-kg red cart moving right at 3 m/s collides inelastically with a 1-kg blue cart moving left at 3 m/s. Total “mass-velocity blocks” are constant before and after. A 2-kg red cart moving right at 3 m/s collides elastically with a 1-kg blue cart moving left at 3 m/s. Total “mass-velocity blocks” are constant before and after. 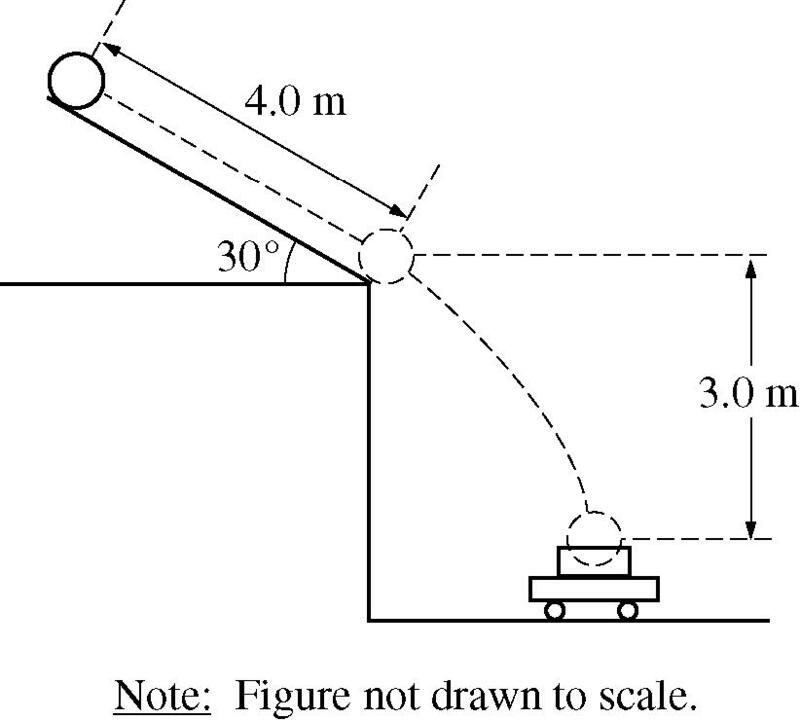 AP Physics C: Today we applied our knowledge of rotational energy, projectile motion, and momentum to bring a 2010 AP exam problem to life. Although the actual values were different, the set-up was the same.